I can’t believe we’re already talking back to school, but here we are. I feel like we lost most of our summer to the move (because, we did), so I’m sort of wishing these next few weeks would slow down a bit. We still have a lot on our summer bucket lists that we want to check off! But, I’d be lying if I said I wasn’t a bit excited about back to school. I can’t wait to get everyone back on a routine and have life be somewhat normal again. This move, man. It’s really thrown us off our groove! I’m also excited about getting the kids back on some sort of normal eating schedule. What is it about summer that makes them want snacks ALL THE TIME? As soon as I was mixing these up they were both in the kitchen, asking incessantly when they’d be done. These totally got the kids’ seal of approval. And mine. 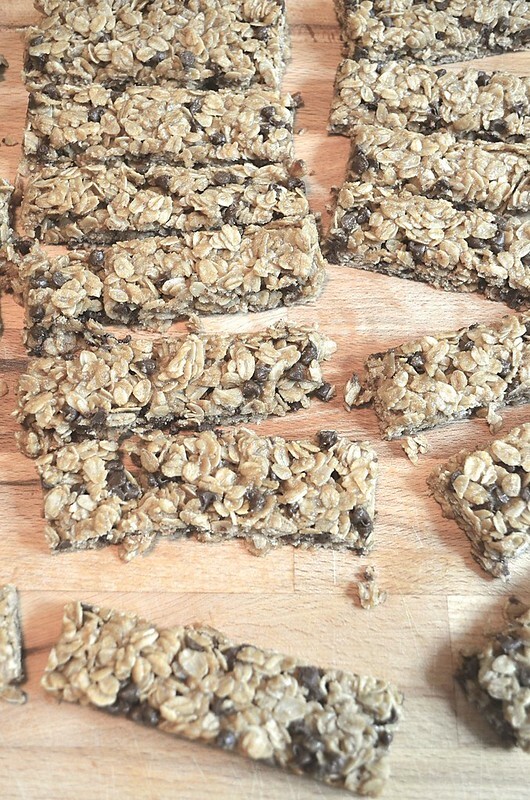 I know no-bake granola bars are generally more popular, but in my opinion, you just can’t beat the chewiness you get from baked ones. They would make a really rocking lunchbox treat or after school snack. Preheat the oven to 350 degrees. Like a 9×13″ pan with parchment and spray with non-stick spray. With an electric mixer, beat together the peanut butter, honey, egg, oil, and vanilla until smooth. In another bowl, combine the oats, sugar, and salt. Add the oats to the peanut butter mixture and stir until evenly combined. Fold in chocolate chips. Pour the mixture into the prepared pan and pat down evenly. Bake for 12-15 minutes, until the edges are golden-brown. Set on a cooling rack for 15 minutes before removing from the pan. Cool completely, and then slice into 18 equal pieces. 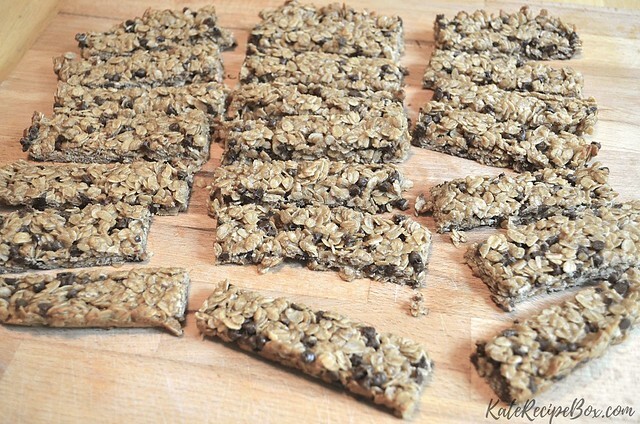 Granola bars are the perfect back to school recipe. 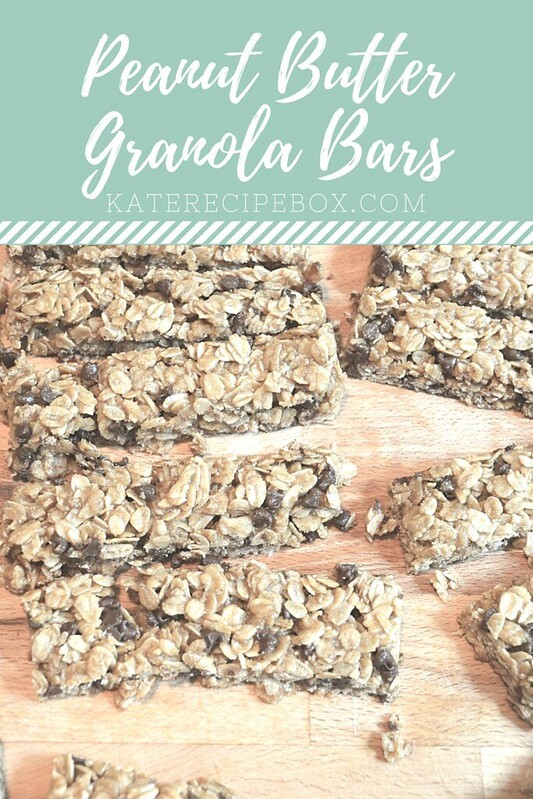 Good for breakfast, as a lunchbox snack or to hand to them when they walk in the door starving and have a couple of hours before dinnertime. So much better made from scratch! The perfect lunchbox or after school snack.